Our lovely, gourmet gift baskets are the perfect treat to send friends, family or clients. Whether you choose the contents personally or allow us to create a special present for you, we guarantee your recipient will be pleased! 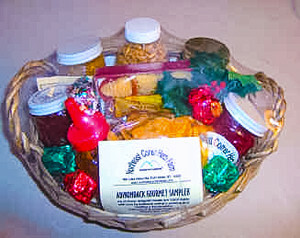 Our popular "Adirondack Gourmet Sampler" basket contains delightful products hand made with love by individual artisans working and residing in the beautiful Adirondack Mountain Region of Upstate New York. All Gourmet Gift Baskets and Adirondack Samplers are Custom Made To Order.